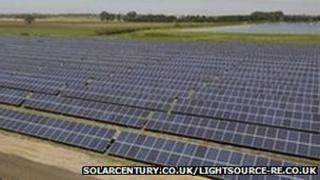 A £40m solar energy scheme on fields in Norfolk covering the equivalent of 124 football pitches has been approved. The 150,000 solar panels, installed on three sites at Litcham, Hardingham and Narford, could create 38 megawatts of electricity - enough energy to power about 9,000 homes. Breckland Council has approved the plans for an area covering about 212 acres in total. The project is being spearheaded by Solar Century, an energy firm. Peter Sermon, Solar Century's vice president of sales, said: "I think it is very important, not just for Solar Century but we as a country have an obligation to increase the amount of electricity produced by renewable sources." A spokeswoman for Solar Century added: "We are delighted (that the plans have been supported by Breckland Council). It is a great step forward for solar energy." Breckland Council officers recommended the schemes be approved. The scheme at Litcham had been opposed by Litcham Parish Council which said it opposed the "industrialisation of a tranquil area". The Hardingham scheme was opposed by its parish council on the grounds that it was out of place for the area.